Have you been experiencing unusually nasty hangovers from your favorite premium whiskey? If you have, it could be because you fell victim to fraudsters who are now targeting expensive alcohol brands in the market in a new smuggling and counterfeiting scam. In the scam, illegal manufacturers are packaging substandard alcohol in premium brand bottles complete with Kenya Revenue Authority (KRA) excise stamps and even manufacturer and distributor batch numbers. “Illicit alcohol is the single largest issue affecting our industry right now. We estimate that 50 percent of alcohol being consumed across Kenya is illicit. It is either traditional or counterfeit alcohol brewed illegally and in unhygienic environments or that whose tax has not been remitted, as required by law,” East Africa Breweries Limited (EABL) Corporate Relations Director Eric Kiniti told the Nation. A recent inspection in entertainment joints revealed fake products being packaged as established liquor brands and sold to unsuspecting customers. In one of the joints inspected, brands of whiskey going for as much as Sh9,000 per 750-millilitre bottle were found to lack basic certification from the KRA, reports Nation. An inspection unit from EABL over the weekend pointed out that some of the batch numbers on liquors supposedly under their distribution chain were fake. Interestingly, the drinks had valid excise duty stickers with a Quick Response (QR) which validated the product after scanning with KRA’s Soma Label mobile application. Two bartenders were arrested at a popular joint over the weekend after they were caught selling uncertified brands. Some of the brands lacked basic health warning stickers in what the inspection team termed as a serious health risk to consumers. According to the EABL team, such drinks are likely to cause adverse after-effects to consumers, which on most occasions, are characterised by nasty hangovers and alcohol poisoning. A huge consignment of the expensive and luxurious whiskeys, brandy and vodka in the market currently is suspected to have been smuggled into the country. While many retailers seem unaware of the products they have been selling, some use the legitimate brands on display in case of random checks but serve the contraband and substandard brands to customers. 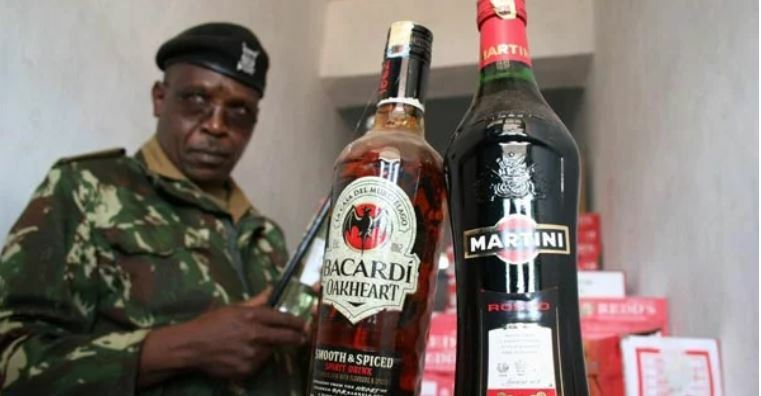 A multiagency crackdown against illicit spirits has continued to bear fruit, but security operatives are being challenged to up their game. “The recent multi-agency enforcement activities have been encouraging, but there is a pressing need for strategic and sustainable efforts to fully eradicate illicit alcohol in future,” said EABL’s Kiniti.